"I love being at UNAM, I feel I can learn a lot here. I'd like to take classes in biology, chemistry and medicine, because I do lots of stuff besides chemistry," 9-year-old genius, Carlos Santamaria Diaz, said. Mexico City - A nine-year-old boy is studying chemistry at the National Autonomous University of Mexico, or UNAM, the institution said in a statement. 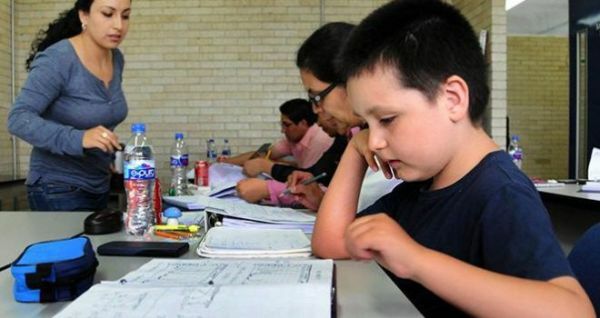 Carlos Santamaria Diaz, whose ninth birthday was on June 29 and is the only student who attends class accompanied by his parents, recently finished his second course: Infrared spectroscopy for magnetic resonance imaging of molecules and masses. "I love being at UNAM, I feel I can learn a lot here. I'd like to take classes in biology, chemistry and medicine, because I do lots of stuff besides chemistry," Carlos said. His parents, Arcelia Diaz and Fabian Santamaria, discovered their son had "scientific curiosity" when he was barely 3 but already learning everything so fast. "Sometimes I watch television or play with my toys. I do a lot of things but I don't use social networks, they don't interest me," said Carlos, who is particularly fascinated by chemistry and biochemistry. "For example, in this course they give me three spectra and ask me what chemical compound it is and they don't give me any data, but whatever seems hard I solve anyway," he said. As little Carlos absorbed more and more knowledge, his father says he felt "no longer up to helping him with his studies," and in the search to find a way to satisfy the boy's longing to learn, he turned to UNAM. In that regard, UNAM professor Eduardo Rodriguez said they made the choice of subjects together - the university administration, Carlos's parents and the boy. "We were afraid to start him on something that would discourage him," he said. "We looked for courses that would encourage his curiosity. The first subject he took was a global concept of chemistry, about how chemical reactions are produced and what things they originate, so he would get a basic knowledge of chemical reactivity," the professor said. In the course Carlos learned to determine how matter is constituted by using complicated techniques that did not, however, require a vast knowledge of mathematics or of any particular category of chemistry. "We didn't dare have him take the whole diploma course right away, because there are seven subjects - but he's already starting the third," Rodriguez said. His mom added that her son "reads in English and understands it very well, particularly because his reading is all about chemistry."